Made by hand and crafted with the finest oils and pure fresh camel milk. A natural source of Alpha-Hydroxy acids – known to plump the skin and smooth fine lines with its anti-aging and antioxidant properties. Contains Vitamins A, B2, C and D.
Camel milk assists in reducing signs of aging such as over pigmentation and age spots. Rich in organic essential oils and minerals. Provides a luxurious and healthy cleansing experience. Loves your skin – no chemicals or artificial additives. Women have recognized for centuries the beautifying properties of camel milk, perhaps the most famous woman in history to have literally indulged in the benefits of camel milk was of course renowned beauty Queen Cleopatra – who contrary to popular belief – bathed in fresh camel milk. She was one smart lady, as it has been found today to have an amazing range of properties for the skin and well as for the body as a whole when consumed. 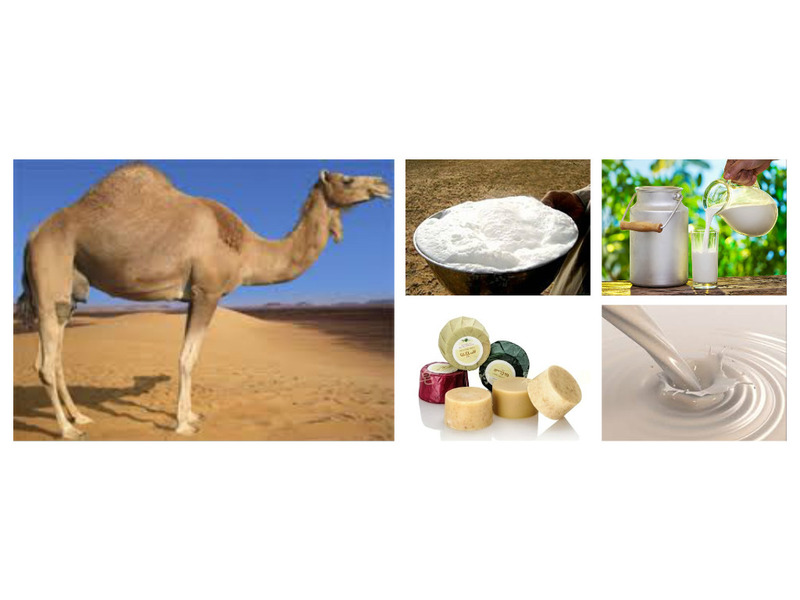 Camel milk – known for millennia qualities skin care and treatment . outstanding high content of protein, more than any other type of milk, these proteins constitute a significant element plus humidity seems natural skin. Camel milk is rich in vitamin C, important anti – oxidant. Excellent for infections or skin lesions, including psoriasis and acne. Very good for dry skin. Camel Milk soap provides a most luxurious bath experience. Camel milk is rich in vitamins A, B and C as well as potassium, iron, sodium, phosphorus, copper, manganese, zinc and magnesium. The milk of the camel has 10 times more iron than cow’s milk and three times more vitamin C. It is a natural source of Alpha and beta Hydroxy acids which research has shown to have the capability of plumping the collagen in skin and thereby visibly smoothing fine lines. It naturally keeps the skin moisturized and prevents sign of aging, sun damage and pigmentation with its gentle exfoliating and lightening effect. In addition to its cosmetic qualities camel milk has anti microbial properties and has been traditionally used by the Bedouin of Arabia for centuries as a cure for many ailments. Camel Milk is also great natural cleanser because it has anti – microbial properties. It is much recommended for allergic skin conditions such as acne as well as having a proven beneficial effect for those who suffer from eczema and psoriasis. By virtue of the high amount of proteins as compared to cow or goat milk it is most effective in reducing inflammation and speeding recovery of such conditions, while being a nourishing and cleansing experience for all ages. Because it is so neutral on the skin it is safe for everyone to use, even the most delicate and youngest skins. Camel Milk is rich in vitamins B and C and has 10 times more iron than cow’s milk. Camel milk is a natural source of Alpha-Hydroxy acids which are known to plump the skin and smooths fine lines.